Welcome to Heaven, a thirty‑year‑old slum hidden between brand‑new high‑rise apartment buildings and technology incubators in contemporary Bangalore, one of India's fastest‑growing cities. In Heaven, you will come to know a community made up almost entirely of women, mothers and daughters who have been abandoned by their men when no male heir was produced. Living hand‑to‑mouth and constantly struggling against the city government who wants to bulldoze their homes and build yet more glass high‑rises, these women, young and old, gladly support one another, sharing whatever they can. This is a story about geography, history, and strength, about love and friendship, about fighting for the people and places we love‑‑even if no one else knows they exist. 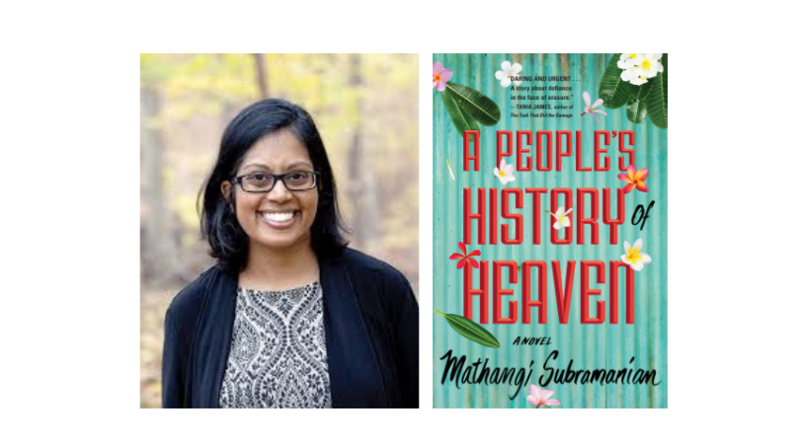 Elegant, poetic, bursting with color, Mathangi Subramanian's novel is a moving and celebratory story of girls on the cusp of adulthood who find joy just in the basic act of living. Subramanian is an award-winning Indian American writer, author, and educator. She is a graduate of Brown University and the Teachers College of Columbia University, and the recipient of a Fulbright as well as other fellowships. Her writing has previously appeared in the Washington Post, Quartz, Al Jazeera America, and elsewhere. This is her first work of literary fiction. “Everything about A People’s History of Heaven is wonderful: the lyrical, light touch of the narrator, the story, the humor, and most of all, the girls.